333 Beacon is located on the south side of Beacon, between Exeter and Fairfield, with 331 Beacon to the east and 335 Beacon to the west. 333 Beacon was designed by architect Samuel D. Kelley and built in 1881-1882 by Frank Jones, mason, for building contractor Samuel Tarbell Ames for speculative sale, one of three contiguous houses (333-335-337 Beacon) of the same design with three story (plus basement) front bays on the eastern side. Samuel Ames is shown as the owner on the original building permit application for the three houses dated October 15, 1881. At about the same time, Samuel T. Ames had two additional houses built to the west, at 339-341 Beacon, also designed by Samuel D. Kelley in a similar style but with bays extending one less story. Click here for an index to the deeds for 333 Beacon. On October 4, 1882, 333 Beacon was purchased from James Barr Ames by Harriet Matilda (Beals) Tuxbury, the wife of attorney George William Tuxbury. They previously had lived at 377 Beacon. George Tuxbury died in April of 1885 and Harriet Tuxbury moved from 333 Beacon soon thereafter. She continued to own the property and lease it to others. During the 1885-1886 winter season, 333 Beacon was the home of shipping merchant Robert Bennet Forbes. His primary residence was in Milton where his wife, Rose Greene (Smith) Forbes, had died in September of 1885. He moved to the Hotel Vendome for the 1886-1887 season, and then to 312 Marlborough. During the 1886-1887 winter season, 333 Beacon was the home of Frederick Daniel Hussey and his wife, Mary (Winston) Hussey. They previously had lived at 1 Gloucester. They had moved by the 1887-1888 season, probably to Louisville, Kentucky, where Mary Hussey died in childbirth in December of 1888. During the 1887-1888 winter season, 333 Beacon was the home of Mary Wallingford (Herrick) Dame, the widow of liquor dealer Frank O. Dame. She and her husband had lived at 283 Commonwealth until his death in February of 1886, after which she had moved to the Hotel Vendôme. By the next season, she had moved back to the Hotel Vendôme. During the 1888-1889 winter season, 333 Beacon was the home of Elizabeth (Torrey) Spooner, the widow of Daniel Nicolson Spooner, a shipping merchant and textile manufacturer. She previously had lived at 196 Commonwealth. By the 1889-1890 winter season, Elizabeth Spooner had moved back to 196 Commonwealth and Harriet Tuxbury was living at 333 Beacon once again. By the 1890-1891 winter season, Harriet Tuxbury was again living elsewhere and 333 Beacon was the home of her son-in-law and daughter, Warren M. Whiting, a wholesale dry goods merchant, and Emily Louise (Tuxbury) Whiting, and their young children: Mason, Louise, and Warner Whiting. Emily Whiting died in June of 1892. By the 1892-1893 winter season, Warren Whiting and their children had moved to 45 Hereford and Harriet Tuxbury was living at 333 Beacon once again. 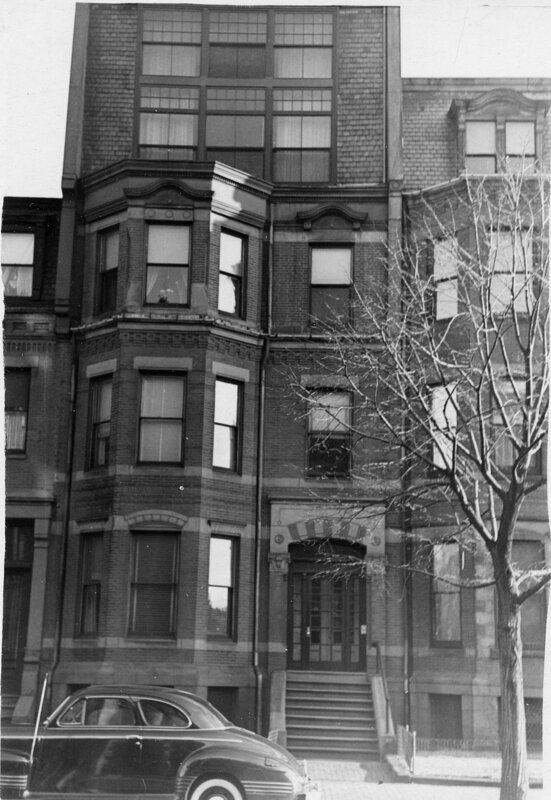 She continued to live there during the 1894-1895 winter season, but moved thereafter to live with her unmarried daughter, Cora, at 155 Newbury, where she died in April of 1897. In her will, she left one-half interest in 333 Beacon to Cora Tuxbury, and the other half interest in trust (with Cora Tuxbury and Warrant Whiting as trustees) for the benefit of Cora Tuxbury and the children of Warren and Emily (Tuxbury) Whiting. They continued to lease 333 Beacon to others. By the 1895-1896 winter season, 333 Beacon was the home of investment banker and stockbroker Philip Van Rensselaer Ely and his wife, Marian Glyde (Bigelow) Horton Ely. In 1894, they had lived at 478 Beacon. Kenneth Horton, Marian Ely’s son from her first marriage to Henry Kenney Horton, Jr., lived with them. He was a real estate dealer. In April of 1900, he married Marguerite Wagnière and they moved to 83 Marlborough to live with her parents, Gustave and Laura Curtis (Huntington) Wagnière. Marguerite Wagnière-Horton subsequently became a concert pianist and composer. The Elys continued to live at 333 Beacon during the 1904-1905 winter season, but moved thereafter to an apartment in The Tuileries at 270 Commonwealth by 1906. By the 1905-1906 winter season, 333 Beacon was the home of Dr. George Herman Powers, Jr., and his wife, Madeleine (Davis) Powers. They had married in June of 1905, and 333 Beacon probably was their first home together. George Powers was a physician and aural surgeon. They continued to live there in April of 1910, at the time of the 1910 US Census, but moved to 371 Beacon later that year. On May 2, 1910, 333 Beacon was purchased from the Tuxbury family by a trust established under the will of Harriet (Upham) Putnam, the widow of John Pickering Putnam. It became the home of her daughters, Mary Upham (Putnam) Fearing, the widow of stockbroker Charles Frederick Fearing, and Sarah Gooll Putnam. They previously had lived with their brother and sister-in-law, John Pickering Putnam, Jr., and Grace Cornelia (Stevens) Putnam, at The Charlesgate at 535 Beacon (J. Pickering Putnam, an architect, had designed The Charlesgate and was one of the owners). In 1905, Mary Fearing and Sarah Putnam had lived at 277 Dartmouth with their mother, who died in May of that year. Sarah Putnam was a portrait painter and watercolorist. It appears that it was during her residence that a the fourth floor was remodeled and a fifth floor added with large windows on both to capture the northern light. There is no record in the Building Department’s files of a permit for this remodeling. However, 333 Beacon is shown as a three story building on the 1908 Bromley map and a five story building on the 1912 map, and the expanded fenestration shows as already existing on plans for remodeling the interior in 1923 (the living area is referred to on those plans as a “studio” with an adjoining “gallery”). Sarah Putnam died in October of 1912. Mary Fearing continued to live at 333 Beacon until her death in February of 1920. The house was not listed in the 1921-1923 Blue Books. On November 3, 1922, 333 Beacon was purchased from the Putnam family by Lynette (Nettie) Dawes (Moore) Baker, the widow of Harry Mudge Baker. Her adult son, Geoffrey Dawes Baker, and her mother, Florence (Dawes) Moore, the former wife of Henry R. Moore, lived with her. They previously had lived in Wilton, New Hampshire. In October of 1923, Lynette D. Baker applied for (and subsequently received) permission to remodel the interior. The current and proposed use was indicated as being a single-family dwelling with one studio apartment. Plans for the remodeling – designed by architects Peare Quiner Nevin and Chickering – are included in the City of Boston Blueprints Collection in the Boston Public Library’s Arts Department (reference BIN D-54). The Bakers continued to live at 333 Beacon during the 1924-1925 winter season, but moved thereafter, possibly back to Wilton, New Hampshire. By 1932, they were living at 459 Beacon. On February 10, 1925, Lynette Baker transferred the property to her son, Geoffrey. On May 22, 1926, the A. F. Baker & Co. foreclosed on a second mortgage given by Geoffrey Baker, and on November 10, 1926, he and they transferred the property to real estate dealer William J. Stober. By the 1925-1926 winter season, 333 Beacon had become the home of Lt. Col. Charles Wellington Furlong. Charles Wellington Furlong was an explorer, anthropologist, painter, teacher, author, and soldier. Trained as an artist, he taught drawing and painting at Cornell University from 1896 to 1904. He then began a career of exploration, and was the first American to explore the interior of the Tierra del Fuego. He served as an intelligence officer during World War I and was an aide to President Wilson during the Paris Peace Conference. In 1923-1924 he attend the Army War College, and remained in the Reserves, attaining the rank of Colonel. In 1925-1926, he had traveled to South America, settling boundary disputes between Peru and Chile, hunting for treasure, and preserving the birthplace of Simon Bolivar. By the 1926-1927 winter season, 333 Beacon also was the home of Edward E. Clive and his wife, Eleanor (Ellis) Clive. They previously had lived at 500 Boylston. Edward E. Clive, born Erskholme Edward Clive, was an actor, better known as E. E. Clive. He had immigrated from England to the United States in 1911, and by the 1920s had a repertory group that performed at the Copley Theatre. His wife, Eleanor (Ellis) Clive, also was an actress. In the 1930s, he moved to Hollywood and played character roles in numerous films. The Clives continued to live at 333 Beacon during the 1927-1928 winter season, but moved thereafter to the Maryland Apartments at 512 Beacon. On January 24, 1928, 333 Beacon was acquired by William Coombs Codman, trustee of the Coombs Real Estate Trust. By the 1929-1930 winter season, 333 Beacon was the home of Daniel Clemens Sayre and his wife, Ann Eliza (Hamilton) Sayre. They previously had lived at 92 Revere. He was a Associate Professor of Aeronautical Engineering at MIT, and later would become Chairman of the Department of Aeronautical Engineering at Princeton. They continued to live at 333 Beacon in 1930, but had moved to 1 Champney Place by 1931. By mid-1930, 333 Beacon had become a three-unit building, as confirmed by a May 20, 1930, Building Department inspection. Among the first residents of the apartments was Mrs. Edwina Forbes (Glenn) Garfield, who had divorced the previous year from James A. Garfield, II, son of the former president. She continued to live there through the 1932-1933 winter season. Also among the first residents was Madame Shari de Lys, a vocal teacher. She continued to live there through the 1931-1932 winter season. On December 23, 1932, the Institution for Savings in Roxbury foreclosed on its mortgage to Geoffrey Baker (which has been assumed by subsequent owners) and took possession of the property. In May of 1933, it applied for (and subsequently received) permission to remodel the property and convert it from three apartments and a studio apartment into four apartments. Plans for the remodeling, designed by architect S. Bruce Elwell, are included in the City of Boston Blueprints Collection in the Boston Public Library’s Arts Department (reference BIN P-110). On November 4, 1937, 333 Beacon was purchased from the Institution for Savings in Roxbury by Gladys M. Robbins. On June 28, 1940, 333 Beacon was acquired from Gladys Robbins by Helen Elizabeth (Maclary) Baader, the widow of Albert Stanley Baader, as trustee of the Early Realty Trust. In May of 1941, she applied for (and subsequently received) permission to remodel the property and increase the number of units from four to five. 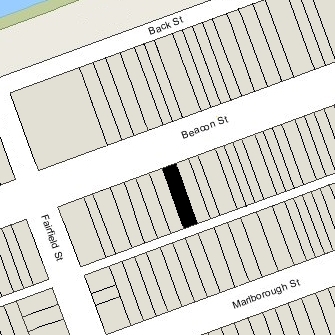 The property changed hands, remaining an apartment house, and was acquired on January 2, 1968, 333 Beacon by John F. Gromko, Jr., George H. Beard, III, and Charles E. Smith. On December 27, 1977, they transferred their interests to John F. Gromko, Jr., as trustee of the Three Thirty Three Beacon Street Trust. On August 4, 1983, 333 Beacon was acquired from John Gromko, Jr., by Carlo A. Sgroi and Gerald J. Kiley, trustees of The 333 Beacon Street Trust. In September of 1983, they applied for (and subsequently received) permission to convert the property from four to five units. The permit application references a 1935 permit in which the legal use was established as four units, and does not note that a subsequent permit was approved in 1941 establishing the legal use as five units. 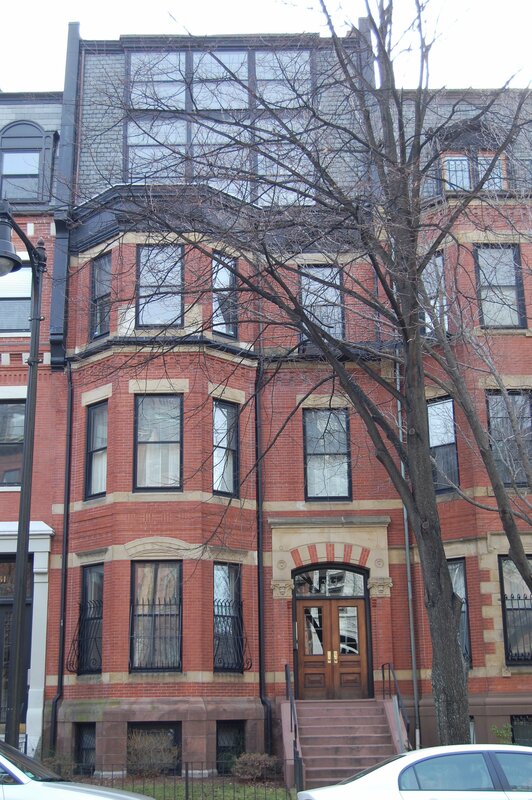 On February 3, 1984, Carlo Sgroi and Gerald Kiley converted the property into five condominium units, The 333 Beacon Street Condominium.